After all the wonderful machines of two weeks ago at Eurobike I returned to the basics of my cycling life to replace my daily work bike. I actually do more miles per year on this machine than any other, perhaps 3000 per year (4500km). Therefore there are rules. It must handle all weather conditions, be bounced on and off trains and yet it has to be so ugly that nobody could possibly contemplate stealing it. Weight completely immaterial, ability to carry significant loads essential. Puncture proof tyres. I achieve this by getting old mountain bike frames or bikes and modifying them with recycled road parts from bikes I have had for up to forty years. The mountain bike setup lets me use fat tyres on very cheap steel frames and use of the parts is just common sense – and appeals to my more miserly side. It has other benefits too. I have learned an enormous amount about creative bike building and repair as I have bashed and bodged various fits together over the years. I have also learned to curse the bike industry for lack of standardisation as I move from bike to bike discovering parts that don’t fit the latest incarnation. The last bike was a Giant Granite that was left in a park in Reading, UK and picked up by a friend who recycles them. However after a several years and a Belgian winter it succumbed to a crack through the frame. Now it has been replaced by an unidentified silver machine with flaking paint and rusty spots for which the only evidence of origin is “Made in Taiwan” stamped on the bottom bracket. Substitution of friction shift levers that I can mount somewhere on the frame is the issue I face every time so I can get rid of the mountain bike changers on the bars. Indexed shifters combined with the brakes are all very well if you have all the matching gear mechanisms and correctly spaced sprockets but that is never going to happen here. The rest usually works with a bit of fiddling and adapting. I am quite happy with it on the first couple of rides to the station but I will probably need a longer/higher handlebar stem at some point. A 25km hilly cross country ride to work on Monday should confirm or remove any other niggles. 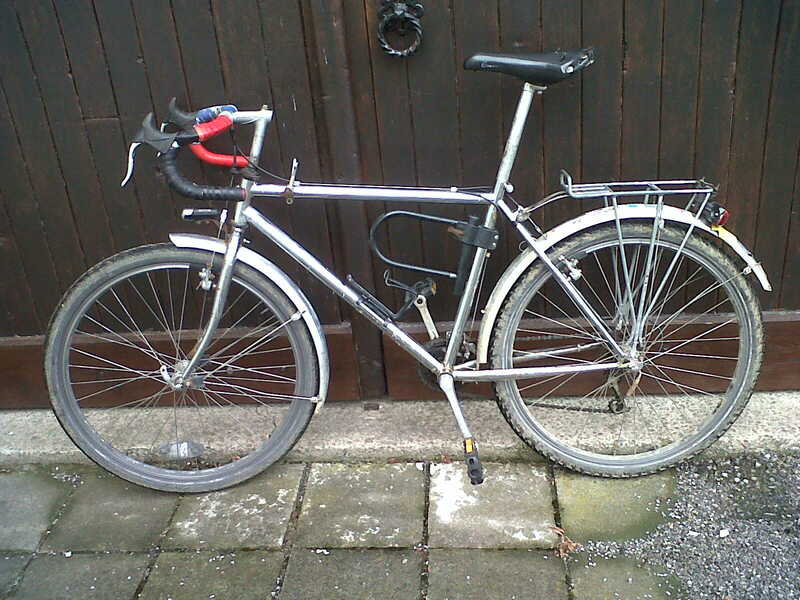 Total cost – €40 on E-bay for the run down MTB and a spare frame thrown in. That will undergo the same treatment to become my son’s student bike. Good value all round! This entry was posted in Bikes, Life in Belgium and tagged bikes, commuting, cycling, Giant, mountain biking by kevinmayne. Bookmark the permalink. THAT is a rather aggressive riding position for a commuter! Good thing I haven’t come across you on the way to or from work! yes, lower than it should be. But you would never be embarrassed by me on a commute, I carry so much gear I get passed by snails. Do I detect top-tube mounted shifters? Yes, fortunately this machine is of a vintage that the top tube is not oversized. Some old-school band-on levers clamped round the tube perfectly. On the last bike the only tube small enough to take frame mounted levers was the handlebar stem. Very smooth in fact, shortening the cable run so much means that they are much more direct. Of course anybody who never grew up with friction shift would have to get used to the idea of finding a gear instead of just clicking, but I like it. Come to think of it, my first “CTC bike” back in the 70s had handlebar stem tube mounted friction gears, along with top bar mounted cross brakes. Those were the days!